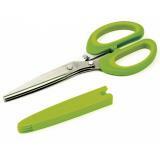 Three high precision, sharp stainless steel blades cut, snip, and mince herbs and scallions while retaining flavorful oils. 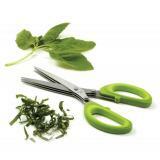 Makes preparing herbs a fast and easy task. Works great on basil, thyme, dill, parsley, chives, mint, fennel, scallions and more. Takes the knife work out of preparing herbs. 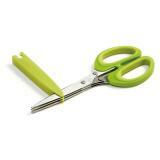 Large, non-slip ergonomic comfort handles. Sheath doubles as a blade cleaner, simply slide over blades while in the closed position.